The 'news' outlet tweeted that the Turkish President had fled to Germany to seek asylum at a critical point in the failed coup attempt that dramatically increased the chances of the government overthrow bid. This week, Turkish Americans and media figures loudly demonstrated outside the world headquarters of NBC News in New York slamming the mainstream US news outlet for its false report on the night of the failed coup attempt in Turkey that dramatically increased the likely that the government overthrow would succeed. NBC News triggered a firestorm after initiating a domino effect among media outlets after incorrectly reporting that Turkish President Recep Tayyip Erdogan had fled Turkey and was seeking asylum in Germany in a number of later deleted tweets posted in the thick of the July 15 coup attempt. 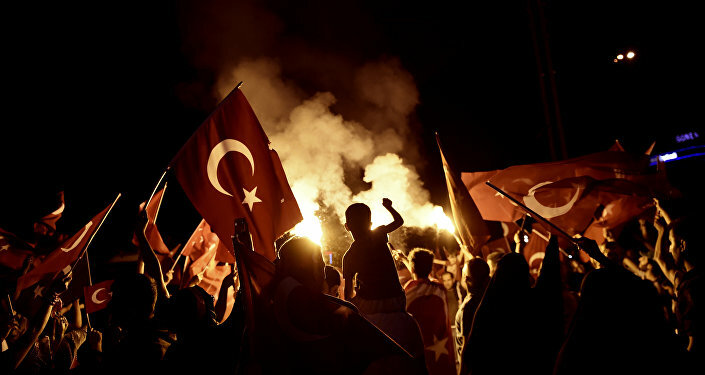 NBC cited an unnamed "senior military official" as the source of the information which immediately went viral on social media and was picked up by a number of traditional media outlets, all of which sourced NBC News causing the misleading information to trickle down to hundreds of millions of readers, including Turks, at a critical moment in the deadly coup attempt. It has been widely speculated that the original source is US General John Campbell who Islamist newspaper Yeni Safak pegged as "the man behind the coup" in a front page article with the military official's face plastered on its front cover. Sibel Edmonds, a Turkish-American dual citizen and former FBI translator, blasted the media outlet saying NBC News was "no longer a news organization." "It’s an extension of the Central Intelligence Agency and Pentagon; this is what they proved here,” Edmonds said. “They actively and directly participated in a coup." In an interview with RT on Friday, WikiLeaks co-founder Julian Assange expressed outrage about the false reporting saying "What the hell is going on there?" "Turkish newspapers are publishing stories around a theory that the United States was behind the attempted coup, that US intelligence sources have supported Fethullah Gulen, the head of the Gulen cult, and that has been called by the Turkish government as the leader of the coup," said Assange. "One of the key evidence points cited by Turkish media is that in the middle of the coup, NBC published that Erdogan was on his way to Germany to seek asylum and they say that this was told to them by a US military source so what the hell is going on there because that went all the way around the world and went to further the chances of success of the coup in Turkey because if the President is gone then you’ve lost control," said the whistleblower. Several hundred Turkish residents died in the bloody coup attempt after the Turkish President made a desperate plea to the public, in an interview on CNNTurk via FaceTime, where he called for the people to take to the streets. The coup plotters, who called themselves the "Council of Peace" and said that they were there to restore democratic practices to the country, turned their weapons on the protesting citizens. In total, over 60,000 people have been fired or arrested in the post-coup purge with President Erdogan hinting at bring back the death penalty for roughly 15,000 individuals imprisoned on charges of treason.